Our son PJ is a handsome 12-year-old boy whom we love and adore! We did not know PJ had any type of illness until he was about 4 1/2 months old. It started with a trip to the emergency department at Seattle Children’s where a number of tests revealed that PJ was having infantile spasms and seizures. After many months of trying lots of different medications, including ACTH which is an injection that we had to give PJ daily, the spasms and seizures would not stop. We were then told about the Ketogenic Diet which, after much consideration, we decided to try. The diet did seem to help, but still nothing could stop the spasms and seizures. We also started the research drug EPI 743 about 3 years ago which we give him along with a plethora of medications and supplements. During the process of starting the Ketogenic diet we were connected with Dr. Saneto. What an incredible blessing that was! After seeing PJ and getting to know him, Dr. Saneto mentioned that it was possible that PJ’s underlying condition may be Mitochondrial Disease. We chose to do the muscle biopsy, and it confirmed that PJ does indeed have Mitochondrial disease with deficiencies in complex II, and IV of the respiratory chain. PJ has many systems in his body that are affected by Mito. 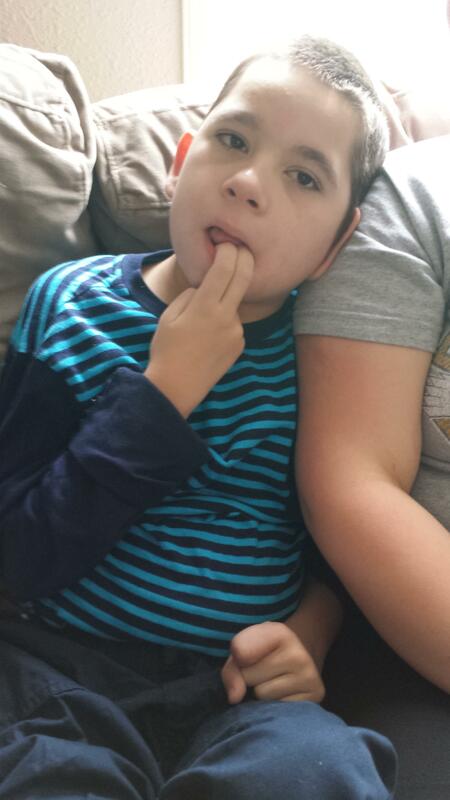 He is physically handicapped, developmentally delayed, he still has seizures (he outgrew the infantile spasms), he struggles with digestive issues, cortical visual impairment, dermatology issues, he has a g-tube and receives 100% of his nutrition through it. Because of these issues, PJ sees many different specialists at Seattle Children’s, he has his primary care team, his school team, and of course his family all working together to keep PJ as healthy and happy as possible. The saying “It takes a village” is definitely true. Each part of PJ’s team is an integral part of his health and happiness.